Vol 1 | Issue 1 | July-Sep 2015 | page: 38-43 | Ruta M Kulkarni, Anurag Rathore, Rajeev Negandhi, Milind G Kulkarni, Sunil G Kulkarni, Arpit Sekhri. Authors : Ruta M Kulkarni, Anurag Rathore, Rajeev Negandhi, Milind G Kulkarni, Sunil G Kulkarni, Arpit Sekhri. Dept. of Orthopaedics, Post Graduate Institute of Swasthiyog Pratishthan, Miraj, Maharashtra. Dept. of Orthopaedics, Post Graduate Institute of Swasthiyog Pratishthan, Miraj, Maharashtra, India. Background: Neglected and residual clubfoot deformities in older children is a difficult surgical problem as the foot in these patients is stiff with some amount of pain and almost always had already undergone some surgical intervention. Basic aim of foot surgeries in such cases is to achieve painless functional plantigrade foot. In this study, a percutaneous dorsolateral closing wedge midfoot osteotomy with correction of angulation and translation deformity was done fixed with k-wires or ilizarov frame. Additional procedures like plantar fascia release and Achilles lengthening procedures were done for associated deformities as required. The aim of this study is to evaluate outcome of the proposed surgical procedure in correction of complex clubfoot deformities. Methods: Our centre is a tertiary care orthopaedic hospital. A total of 25 patients [32 feet] were included in this retrospective study done from august 2009 to august 2014. Patient aged 5-12 years were selected for the surgical procedure. All the patients were followed up at least up to 18 months after surgery. Both preoperative and postoperative evaluation of patients done clinically, with help of dimeglio score, and radiologically. Results: Follow up period ranged from 18-30 months. Clinical and radiographic improvement was achieved in all the patients. Dimeglio score improved from 10.63 to 2.93 which denotes good result. All radiographic angles showed correction to near normal values. All the patient showed pain relief and optimal function at 18 month follow-up. Complications in form of pin tract infection, under correction and skin problems were noted in three, three and five patients respectively. Conclusion: A percutaneous dorsolateral closing wedge osteotomy in combination with plantar fascia release and Achilles tenotomy is a good alternative procedure for neglected and recurrent clubfoot deformities with minimal complications. This is a joint sparing surgical technique which preserves ankle and foot flexibility. Keywords: Relapsed, neglected, clubfoot, midfoot osteotomy, dimeglio score. The four basic components of clubfoot are cavus, adduction, varus, and equinus. Successful correction of clubfoot deformity generally is reported in more than 90% of children two years and younger treated with Ponseti casting even after previous unsuccessful non-operative treatment . Neglected clubfoot include feet that had not been treated in the past and relapsed clubfoot included feet that had undergone one or more surgical procedures but still had deformity . Neglected or relapsed clubfoot deformity remains a major congenital disability in children and adults in developing nations . Approximately 25% of operated clubfeet recur or have marked residual deformity, mainly owing to insufficient primary treatment . The less is sufficient the intervention, the more severe is the relapse or residual deformity . Multiple soft-tissue or bony operations often result in a stiff and painful foot in relapsed clubfoot patients.. These children face difficulties in walking long distances, playing games and carrying out routine daily activities. They are also prone to get repeated wounds at callosities formed over dorsum and lateral border of foot due to inability to wear normal footwear (figure 1 & 2). The goal of management in such patients is to obtain a plantigrade, painless, and functional foot. The patient should be able to use normal footwear at the end of treatment . Numerous soft tissue procedures [releases, tendon lengthening, tendon transfer and redressment by means of an external fixator] and osseous interventions [osteotomies, arthrodesis] have been discussed in the literature which can be used according to “ala cart” approach. Yet, there are no clear guidelines for the surgical management of relapsed clubfoot [7-10]. Extensive soft tissue releases in such relapsed and neglected cases often lead to wound healing problems and persistent deformities whereas procedures like triple arthrodesis is associated with stiffness and ankle arthritis as early as three years postoperatively . Talectomy is associated with a high incidence of Hind foot recurrence, pain, and spontaneous bony ankyloses in the tibio-tarsal joint . We have performed a percutaneous dorsolateral closing wedge midfoot osteotomy along with additional procedures like steindler release, posterior soft tissue release and tendoachilles lenthening as required to correct various clubfoot deformities in neglected and relapsed cases. The osteotomies were either fixed internally with help of k-wires or fixed externally with ilizarov. Ilizarov used mostly in patients having rigid hind foot varus deformity. The aim of this study is to evaluate the clinical and radiological outcome of the proposed surgical technique in correcting the various deformities in neglected and relapsed cases of clubfoot. This is a retrospective study conducted at tertiary level orthopaedic hospital. A total of 25 patients with 32 affected foot were included in this study done between august 2009 to august 2014. 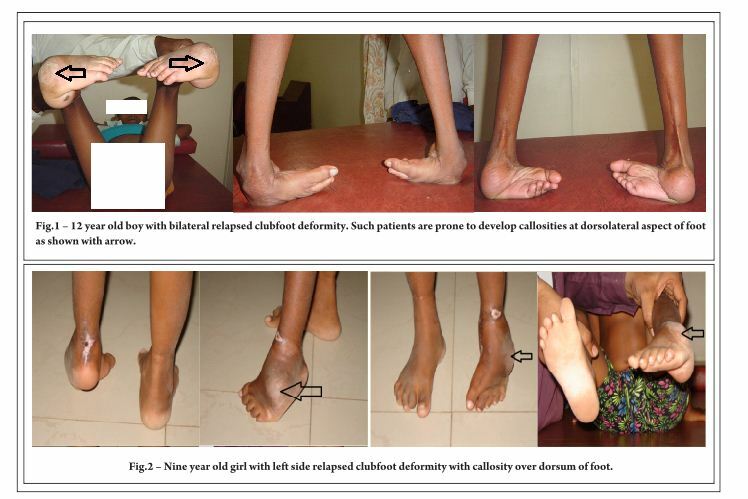 The patients selected with age more than five years having neglected and relapsed clubfoot deformities including both idiopathic and syndromic varieties. Patients excluded were above 12 years of age or those who were medically unfit for surgery. Approval for the study was given by ethical committee of the institute and informed consent was obtained from all the patients. Data were collected in a predesigned proforma which included detailed history obtained from the informants of the patient including the birth history, developmental history, family history and history of any previous surgery. On clinical examination, the foot was examined to note all the deformities that were present and the rigidity of foot was also examined based on the maximum possible correction achieved by manipulation. It was also determined that whether the rigidity is due to soft tissue tightness or defect in skeletal architecture of foot. The cavus was examined to establish the apex of the deformity. Using the Coleman Block Test, the flexibility of the heel varus was checked. Based on patients clinical examination, a preoperative dimeglio scoring  of all the affected foot was done. Dimeglio classification includes scoring of varus , equinus , derotation of calcaneopedal block and adduction on the scale of 0 to 4 according to severity of deformity. Additional 1 point assigned each for posterior crease , medial crease , Cavus and poor muscle condition. Score of <5 denotes benign, 5-9 is moderate, 10-14 is severe and 15-20 is very severe deformity. AP and weight bearing lateral x-rays of the foot with ankle were taken, also lateral x-ray of foot with ankle is taken in maximum possible dorsiflexion. Talus-1st metatarsal angle and talo-calcaneal angle for adduction, meary’s and hibb’s angle for cavus, tibio-calcaneal angle for equinus were measured preoperatively in all the affected foot. The patients were evaluated postoperatively for dimeglio score and various radiographic angles. The follow up visits were scheduled at 1st month, 2nd month, 3rd month, 6th month and thereafter at six monthly intervals. Patients were also evaluated clinically for wound condition, position of foot, ankle ROM, neurovascular status of foot and radiologically for union, position of implant and alignment. Surgical technique: The patient is placed in supine position on a radiolucent table after administering anaesthesia. Tourniquet is inflated after exsanguinating the limb. Local parts are cleaned, painted and draped. Steindler’s release is performed in a percutaneous fashion. Posterior soft tissue release and tendoachilles z-plasty done in few cases with severe equinus. Transverse incision is taken over the cuboid (Fig 3A) and subcutaneous dissection is done. Abductor digiti minimi muscle is encountered at the lower part of cuboid which is retracted away. Two K-wires are inserted, one through distal end of cuboid and second through proximal end of cuboid under IITV guidance (Fig 3B & 3C). The wires are within the cuboid without compromising the distal or proximal articulation of the cuboid. Both the wires are advanced from the dorsolateral aspect of the foot till the medial border of medial cuneiform where they meet. Using an osteotome and mallet, the osteotomy is performed between the k wires (figure 3D & 3E). The wedge is removed with a rongeur. The osteotomy is closed dorsolaterally along with some translation and confirmed with IITV (figure 3F). The osteotomy is fixed with two K-wires through the cuboid (figure 3G) and confirmed under IITV (figure 3H & 3I). In cases where osteotomy could not be completed through lateral incision, it is done through small incision medially over medially cuneiform. In complicated deformities or severe contracture external fixation with Ilizarov foot and ankle frame is done and gradual correction is obtained. The skin incision is closed with ethilon. Tourniquet deflated and sterile dressing is done and below-knee splint in corrected position is given. Postoperative management: Three days of intravenous antibiotics are given along with an epidural for pain relief. A well-padded below knee non weight bearing cast is applied as soon as oedema subsides and the wound is healthy. If associated procedure requires, then above knee cast is applied. Patients are discharged on the fourth or fifth postoperative day and nonweight bearing is advised for six weeks. After six weeks, the Kirschner-wires and cast are removed, and a below knee weight bearing cast applied which is removed after one month and plastic molded ankle-foot orthosis is applied to be worn for six months. Statistical analysis was done by using Microsoft Excel and SPSS-22. Means and standard deviation score were obtained. Paired t-test was used to compare the mean of preoperative and postoperative values. A total of 25 children [32 feet] were available for final evaluation. Seven children had bilateral deformity and 18 had unilateral deformity. Among 25 children, 4 [7 feet] were of the neglected type and 21 [25 feet] were of the relapsed type. The age at surgery ranged from 5-12 years with a mean age of 8.16 years [S.D. = 2.05]. The follow-up period ranged from 18-30 months. There were 11 boys and 14 girls. Osteotomy site was fixed with k-wires in 22 patients [28 feet] and with ilizarov in 3 patients [4 feet]. Preoperative Evaluations- of the 32 feet, 6 feet were classified as grade IV, 8 feet were grade III, 15 were grade II and 3 were grade I Dimeglio deformity. The mean preoperative Dimeglio score was 10.63 [S.D. =4.086] which comes under grade III deformity. Mean preoperative talus-1st metatarsal angle, tibiocalcaneal angle, meary’s angle, hibb’s angle and talocalcaneal angle were -7.59˚, 69.94˚, 5.94˚, 137.53˚ and 10.16˚ respectively. Follow up Evaluations at one year- Of the 32 feet, 27 feet improved to grade I, 2 feet were grade II and 3 feet were grade III. The mean postoperative Dimeglio score was 2.97 [S.D. =2.868]. Mean postoperative talus-1st metatarsal angle, tibiocalcaneal angle, meary’s angle, hibb’s angle and talocalcaneal angle were 8.53˚, 43.63˚, 1.66˚, 153.78˚ and 34.34˚ respectively. All the patient showed improvement in clinical and radiological scores (Fig 4) at one year follow up, quantitated with preoperative and postoperative evaluations which proved highly significant statistically (table 2 & 3). All patients noted significant improvement in appearance of feet (Fig 5) and ease in fitting into shoes and were pain free. Union at osteotomy site occurred at an average of 5 weeks. Complications: Out of 32 feet, 3 developed pin tract infection which resolved with antibiotic treatment, 5 feet had wound healing problem due to previous callosities in neglected cases which healed with regular dressing and 3 feet found with under correction which required revision surgery. There was no reduction noted in ankle range of motion in any of the case treated With k wires. Residual and recurrent clubfeet deformities are a difficult problem. Feet are stiff and have usually been operated at least once. Traditionally, treatment of stiff clubfoot deformities included extensive soft-tissue release in younger children and osteotomies in older patients. Nearly all patients with severe residual clubfoot [most of our patients] already underwent at least 1 soft-tissue release. Therefore, there is little hope that another release will dramatically improve the situation. Tendon transfer can improve only dynamic deformity and is contraindicated for correcting stiff deformities . Acute osteotomy correction can be a powerful method of correction . The closing wedge osteotomies of Cole basically provided uniplanar correction with very minimal biplanar correction . Jahss created an osteotomy distal to the usual apex of deformity . Japas developed a V-shaped osteotomy that was located near the apex of the deformity but was limited in the degree of multiplanar correction by the ‘V’ limbs of the osteotomy . Akron dome midfoot osteotomy addresses the center of the deformity and provides multidirectional correction . Wicart and Seringe proposed a Plantar Opening-Wedge Osteotomy of Cuneiform Bones combined with selective plantar release and Dwyer osteotomy which the authors hypothesize provides real detwisting of the helicoidal deformity . Shingade et al proposed a single stage procedure including Percutaneous Achilles tenotomy with plantar fasciotomy and dorsal closing wedge osteotomy for the management of neglected or relapsed clubfeet . Our procedure of a dorsolateral closing wedge osteotomy with slight translation and Steindler’s procedure provides correction at the apex of the deformity and allows proper positioning of the foot. Cole et al, recommended the use of plantar release in the form of Steindler or modified Steindler’s release along with the midfoot osteotomy [16, 18, 20, 22]. Jahss et al on the other hand suggested leaving the plantar structures undisturbed so as to support the osteotomy and obviate the need of any internal fixation . We routinely performed the Steindler’s procedure in a percutaneous fashion in all our patients. We kept the children for a while longer in the cast to ensure solidity of the union which allows weight bearing and full return to activity. We had no case of non-union of the osteotomy. Wicart-Seringe had a mean post operative Meary’s angle of 6 degrees and 75% of the patients had lower than preoperative Meary’s angle at final follow up . The dorsolateral closing wedge osteotomy used in our study is successful in correcting the cavus and maintaining it, as the post-operative values of Hibb’s and Meary’s angles are near normal values. Most studies have performed additional procedures [steindler’s release for cavus and posterior release for equinus] after the midfoot surgery. One of the goals of our study is to document the associated abnormalities and correct them along with the midfoot surgery in order to give the child a functional limb. All these procedures were done to give the child a functional limb after one surgery only and appropriate postoperative protocols were followed. Also, the absence of loss of range of motion of ankle joint after the midfoot osteotomy shows the efficacy of the post-operative rehabilitation protocol followed by us. 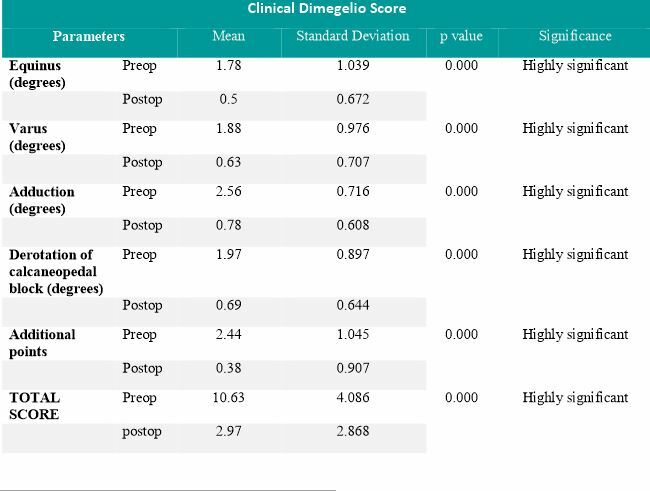 The patients were evaluated by the Dimeglio score. The mean score in our study improved from 10.63 to 2.97 with 90% patient showing good result… Giannini et al, reported that 72% of their patients had a good to excellent result while the other 28% had poor to fair result . This shows that our technique and rehabilitation provides a good result in appropriately selected patients. Average follow up duration in our study was 25 months which is less compared to the Akron group where mean follow up was for 17.3 years and the Wicart-Seringe paper where it was 6.9 years. Giannini et al had a mean follow up duration of 7 years [19, 20, 22]. Probably due to the shorter duration of follow up in our study we have not been able to identify those feet which may require triple arthrodesis in the future. Wicart and Seringe reported 33% of patients at final follow up requiring triple arthrodesis . With the proposed surgical procedure, angular and translational deformity correction in 3 planes can be achieved simultaneously in cases of severe neglected and residual clubfoot deformities without need of extensive soft tissue release. This technique is especially effective with low rates of arthritic degeneration and stiffness in adjacent joints and little reduction of ankle and foot flexibility. The proposed midfoot osteotomy initiates forefoot abduction with center of rotation at subtalar joint eventually causing derotation of whole calcaneopedal block which also pushes calcaneum into abduction. So we can correct forefoot adduction, flexible heel varus and cavus by this dorsolateral closing wedge midfoot osteotomy. In some cases of rigid heel varus which cannot be corrected by midfoot osteotomy alone, we might require a calcaneal osteotomy or gradual correction of deformity with ilizarov ring fixator. We found that, with this surgical technique, correction of complex clubfoot deformities was achieved in almost all cases. The only complication reported by the Akron group were superficial skin sloughs in 2 patients and one case of cellulitis . Giannini had 4 cases of wound dehiscence and 2 cases of non-union of the osteotomy . Levitt et al, reported a 30% rate of pseudoarthrosis with a midfoot osteotomy . The most severe complication we encountered was a recurrence of the deformity. No neurovascular injuries were present. The shortening of the foot was also not significant as no patient needed mismatch footwear. Other complications we had in our patients were under correction, pin tract infection and wound healing problems. The Akron group defined failure of their procedure based on the age of the patient, severity of initial deformity, muscle weakness and any forefoot or hind foot deformity requiring surgery. They had an overall satisfactory rate of 76%, while in children more than 8 years the rate was 82% . We defined failure based on the recurrence of deformity. 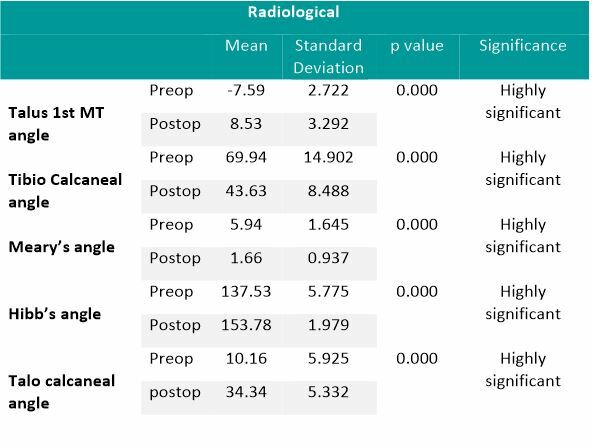 Recurrence for us is increase in dimeglio score and change in radiographic angles to preoperative values. Neglected or relapsed, late presenting clubfoot deformities. Postoperative rehabilitation protocol should be well structured and rigorously adhered to for achieving a functional foot and ankle. The proposed midfoot osteotomy is a minimally invasive procedure done percutaneously providing excellent correction of clubfoot deformities. It is a joint sparing procedure and it does not hampers the mobility at intertarsal and tarsometatarsal joints. It is a cost-effective surgery as the osteotomy is fixed with k wires. In almost all the cases, outcome of this surgical technique is painless plantigrade functional foot. 1. Canale ST, Beaty JH. Congenital anomalies of lower extremity. Campbell’s Operative Orthopaedics. 2. 12th ed. philadelphia: mosby; 2013. p. 995-7. 2. Ponseti I. Clubfoot: Ponseti Management. In: Staheli L, editor. 2nd ed: Global-HELP Organisation; 2005. p. 8. 3. JN P. The neglected clubfoot. Tech Orthop. 2005:153-66. 4. Raab P, Krauspe R. [Recurrent club foot]. Der Orthopade. 1999;28:110-6. 5. Vizkelety T, Szepesi K. Reoperation in treatment of clubfoot. Journal of pediatric orthopedics. 1989;9:144-7. 6. Ponseti IV. Treatment of congenital club foot. The Journal of bone and joint surgery American volume. 1992;74:448-54. 7. Davidson RS. Clubfoot salvage: a review of the past decade’s contributions. Journal of pediatric orthopedics. 2003;23:410-8. 8. Dierauer S, Schafer D, Hefti F. [Osteotomies of the mid- and back-foot in recurrent club foot]. Der Orthopade. 1999;28:117-24. 9. Harvey AR, Uglow MG, Clarke NM. Clinical and functional outcome of relapse surgery in severe congenital talipes equinovarus. Journal of pediatric orthopedics Part B. 2003;12:49-55. 10. Laville JM, Collin JF. [Treatment of recurrent or neglected clubfoot by Ilizarov’s appliance]. Revue de chirurgie orthopedique et reparatrice de l’appareil moteur. 1992;78:485-90. 11. Pell RFt, Myerson MS, Schon LC. Clinical outcome after primary triple arthrodesis. The Journal of bone and joint surgery American volume. 2000;82:47-57. 12. Legaspi J, Li YH, Chow W, Leong JC. Talectomy in patients with recurrent deformity in club foot. A long-term follow-up study. The Journal of bone and joint surgery British volume. 2001;83:384-7. 13. Dimeglio A, Bensahel H, Souchet P, Mazeau P, Bonnet F. Classification of clubfoot. Journal of pediatric orthopedics Part B. 1995;4:129-36. Orthopaedics. Philadelphia: Lippincott Williams & Wilkins; 2011. p. 657-65. 15. Paley D. The correction of complex foot deformities using Ilizarov’s distraction osteotomies. Clinical orthopaedics and related research. 1993:97-111. 16. WH C. The treatment of claw foot. J Bone Joint Surg 1940:895-908. 17. Jahss MH. Tarsometatarsal truncated-wedge arthrodesis for pes cavus and equinovarus deformity of the fore part of the foot. The Journal of bone and joint surgery American volume. 1980;62:713-22. 18. Japas LM. Surgical treatment of pes cavus by tarsal V-osteotomy. Preliminary report. The Journal of bone and joint surgery American volume. 1968;50:927-44. 19. Wilcox PG, Weiner DS. The Akron midtarsal dome osteotomy in the treatment of rigid pes cavus: a preliminary review. Journal of pediatric orthopedics. 1985;5:333-8. 20. Wicart P, Seringe R. Plantar opening-wedge osteotomy of cuneiform bones combined with selective plantar release and dwyer osteotomy for pes cavovarus in children. Journal of pediatric orthopedics. 2006;26:100-8. 21. Shingade VU SR, Ughade SN. Correction of neglected or relapsed clubfoot deformity in an older child by single-stage procedure: early results. Curr Orthop Pract. 2012:122-9. 22. Giannini S, Ceccarelli F, Benedetti MG, Faldini C, Grandi G. Surgical treatment of adult idiopathic cavus foot with plantar fasciotomy, naviculocuneiform arthrodesis, and cuboid osteotomy. A review of thirty-nine cases. The Journal of bone and joint surgery American volume. 2002;84-A Suppl 2:62-9. How to Cite this Article: Kulkarni RM, Rathore A, Negandhi R, Kulkarni MG, Kulkarni S G, Sekhri A. Treatment Of Neglected And Relapsed Clubfoot With Midfoot Osteotomy: A Retrospective Study. International Journal of Paediatric Orthopaedics July-Sep 2015;1(1):38-43.